Waitrose & Partners is introducing a multi-coloured single rose this Valentine’s Day following the popularity of its Language of Love bouquet, an arrangement of rainbow roses, which sold out in 2018. The Language of Love Bouquet proved so popular with online shoppers last year that the supermarket has increased orders of the bouquet for this Valentine’s Day by 50%. The retailer has also added a new single rainbow rose to its selection of flowers in its shops this year due to demand for the colourful roses. Chris Wood, Waitrose & Partners Florist comments, "Flowers are for everyone to enjoy, especially on the most romantic day of the year. We offer a wide selection of bouquets that recognises the diversity of our customers and have a choice of flowers that appeals to everyone in love. “The rainbow roses proved so popular last year that we’ve brought them back and introduced a single stem too, so that even more of our customers can enjoy the romance of Valentine’s Day." The bouquet reflects the colours of the rainbow, a symbol often used to represent the LGBT community. Featuring an array of rainbow roses, with each colour symbolising a different meaning - such as pink representing sweetness, grace and gratitude and orange which symbolises desire and fascination. The supermarket is part of the John Lewis Partnership, which has an LGBT network called Pride in the Partnership, of over 700 members and is open to all Partners and contracted staff. Connor Lennon, a member of the Pride in the Partnership Network comments, "Our aim is to create an environment where everyone feels comfortable to be themselves. It's great that Waitrose is supporting this with its rainbow roses to symbolise diversity and is looking at ways to ensure we are inclusive as a retailer and finding products that represent this." 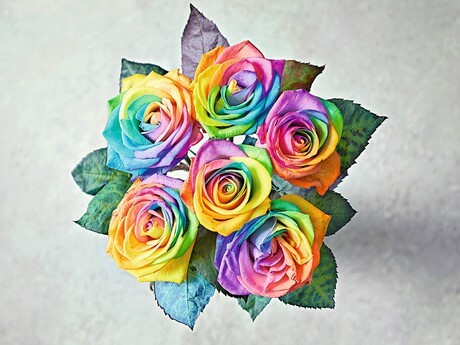 The Single Rainbow Rose is priced at £5 and available in Waitrose shops, while the Language of Love bouquet is available on the Waitrose Florist website for £35.